Men and women in the United States generally agree on many of the personal qualities and competencies they see as essential for political and business leaders to have. But there are notable differences in the importance they ascribe to some of those qualities, according to a new Pew Research Center survey. 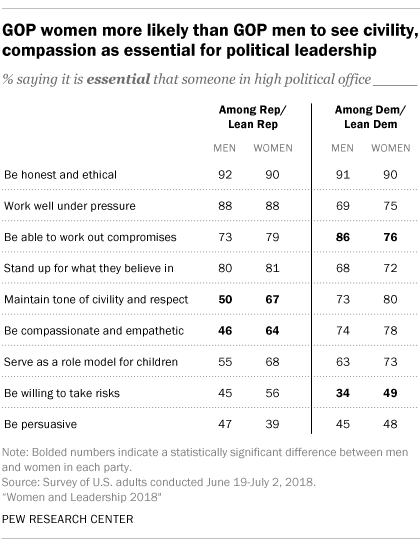 Large majorities of men and women alike say it’s essential that politicians in high offices be honest and ethical (91% and 90%, respectively), work well under pressure (79% each), be able to work out compromises (79% and 77%) and stand up for what they believe in (74% and 75%). These are the top four qualities of nine political characteristics tested in the survey, which was conducted online in June and July. But while three-quarters of women (75%) say it’s essential that political leaders maintain a tone of civility and respect in politics, men are 14 percentage points less likely to say this (61%). 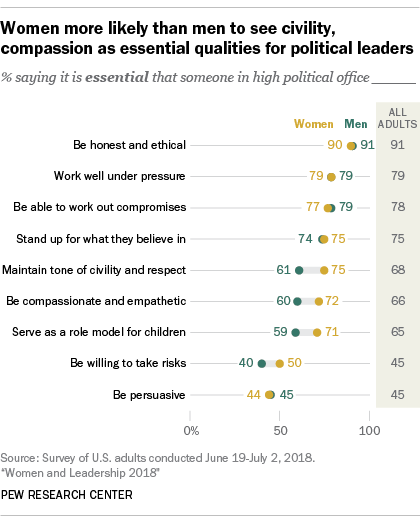 And while around seven-in-ten women say it’s essential that politicians in high offices be compassionate and empathetic (72%) and serve as a role model for children (71%), the shares of men who see these qualities as essential are lower (60% and 59%, respectively). Women are also more likely than men to see a willingness to take risks as an essential quality for those in high political offices (50% vs. 40%). The survey also asked Americans whether they see each of 12 behaviors and competencies as essential for business leaders to have. It again found sizable differences between the views of men and women on certain qualities. About nine-in-ten women (91%) say it’s essential that those in top executive business positions provide fair pay and good benefits, a view shared by 77% of men. Women are also 14 points more likely than men to say it’s essential that business leaders consider the impact of business decisions on society (72% vs. 58%). There are also gender gaps on whether it’s essential that business leaders stand up for what they believe in, negotiate profitable deals, value people from different backgrounds and be compassionate and empathetic. Women are more likely than men to see all but one of these four qualities as essential for business leaders to have. The exception is negotiating profitable deals: Men are 10 points more likely than women to see this as essential (73% vs. 63%). In other areas, including being honest and ethical and creating a safe and respectful workplace, men and women have similar views. Views on some of the qualities seen as necessary for political and business leadership differ by party. For instance, Democrats and Democratic-leaning independents are more likely than Republicans and Republican leaners to say it’s essential that political leaders maintain a tone of civility and respect in politics (77% vs. 57%) and be compassionate and empathetic (76% vs. 53%). Republicans, by contrast, are more likely than Democrats to say it’s essential for those in high political offices to work well under pressure (88% vs. 72%). There are also partisan differences when it comes to some business qualities. Republicans are again more likely than Democrats to see the ability to work well under pressure as essential for business leadership (80% vs. 68%), while Democrats are more likely than Republicans to say it’s essential that executives value people from different backgrounds (78% vs. 55%). In addition to differences between the political parties, there are gender differences that exist within each party. Among Republicans and Republican-leaning independents, two-thirds of women (67%) say it’s essential that those in high political offices maintain a tone of civility and respect, compared with half of men (50%). And while 64% of GOP women say it’s essential that political leaders be compassionate and empathetic, 46% of Republican men share that view. Among Democrats and Democratic-leaning independents, men are more likely than women to say it’s essential that political leaders be able to work out compromises (86% vs. 76%). But Democratic women are more likely than Democratic men to see a willingness to take risks as an essential quality for political leaders to have (49% vs. 34%). When it comes to the characteristics that Americans see as essential for business leadership, around eight-in-ten Democratic women (81%) say it’s essential that top executives consider the impact of business decisions on society. That view is shared by a smaller share of Democratic men (63%). Similarly, Democratic women are 17 points more likely than Democratic men to see an ability to work well under pressure as essential for business leaders (76% vs. 59%). Among Republicans, women are 20 points more likely than men to say it’s essential that business leaders be compassionate and empathetic (62% vs. 42%). They are also substantially more likely than GOP men to say it’s essential that business leaders provide fair pay and good benefits (89% vs. 71%), value people from different backgrounds (64% vs. 46%) and stand up for what they believe in, despite pressure to make a profit (70% vs. 53%).